Bridget Fitzhugh, a dental hygiene student, and nursing student Kinsey Melton get ready to examine a patient’s teeth at the 12th Street Health & Wellness Center in Little Rock. 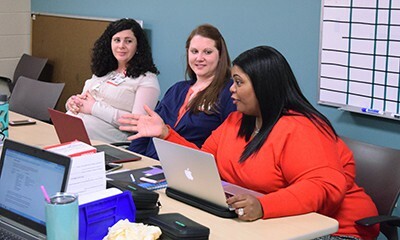 June 19, 2017 | June 19, 2017 | Two clinics — the 12th Street Health & Wellness Center in Little Rock and the North Street Clinic in Fayetteville — exemplify UAMS’ commitment to interprofessional education. The free clinics are staffed by student volunteers from all five colleges and the Graduate School. The North Street Clinic treats only Marshallese patients with diabetes who do not have a health insurance while the 12th Street Center is open to anyone. Preceptors (from left) Chelsea Trout, M.S., PA-C, and Melissa Clark, Pharm.D., M.P.H., both assistant professors in the College of Health Professions’ Physician Assistant (PA) program, chat with 12th Street clinic Director Lanita White, Pharm.D., in the “War Room” before students begin presenting cases. 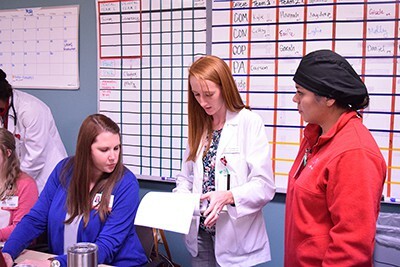 To do this, the students are divided into interprofessional teams that will see patients. For example, one patient might be seen by a group that includes one student each from the College of Medicine, College of Pharmacy and College of Health Professions. Another patient might be treated by students studying to become a nurse, a dental hygienist and a physician assistant. If needed, a Spanish interpreter may also accompany the team. 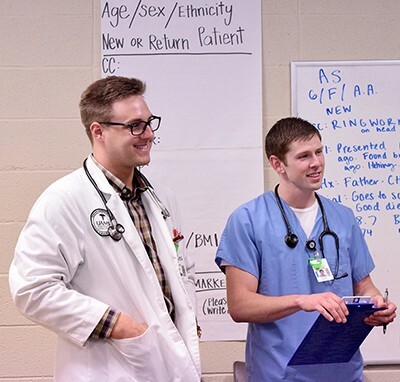 Carson York, a PA student, and nursing student Colby Murphy present a ringworm case to the preceptors in the “War Room” at the 12th Street clinic. After examining the patient, each group huddles together to determine a preliminary plan. Then, the students go into the preceptor room, affectionately called the “War Room,” and give the preceptor team a rundown of the patient’s medical history and symptoms. The interprofessional preceptor team, which has licensed professionals from each of the colleges, asks the students questions, gives advice and uses the time together to teach within and across professions. Then one of the licensed professionals goes back to see the patient and make sure the students haven’t missed anything. “In the War Room, we ask the students questions, and have a conversation with them about their patient. The conversations are very rich because the students are getting questions that they might not otherwise get from someone who shares the same degree they are seeking,” said White. Mitzi Efurd, Ed.D., R.D.H., associate professor and chair of Dental Hygiene, said she makes it a point to ask the students about patients’ oral health needs. Kaitlin Long, a fourth-year pharmacy student, works with PA student Molly Koch to schedule a follow-up appointment for a patient at the 12th Street clinic. White said the clinic’s teaching method isn’t the most time efficient, but it is worth it. Chelsey Trout, M.S., PA-C, an assistant professor in CHP’s Physician Assistant program and a regular preceptor at the clinic, agreed. The North Street Clinic in Fayetteville operates in a similar manner to the 12th Street clinic, said Manjeshwar Sahana Kamath, Ph.D., P.T., an assistant professor in the Department of Physical Therapy who supervises the physical therapy students volunteering at the clinic. Preceptor Melissa Clark, Pharm.D., M.P.H., helps Summer Mojica, a student in the PA program, and Alexandria Perez, a dental hygiene student, determine the correct vaccination schedule for a patient. The physical therapy students are joined by their peers in the College of Medicine, College of Nursing and College of Pharmacy. 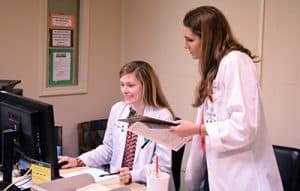 Occasionally, students from the University of Arkansas at Fayetteville’s psychology department also help at the clinic. Increased cultural sensitivity is also something that students at the 12th Street clinic gain, said White. When the clinic opened in January 2013, most of the patients were African-American or Caucasian. After the Affordable Care Act went into effect, Hispanics eclipsed both groups and now make up about 75-80 percent of the clinic’s patient population. That high Hispanic population brings with it the need for interpreters — a role that a number of volunteers fill at the clinic. 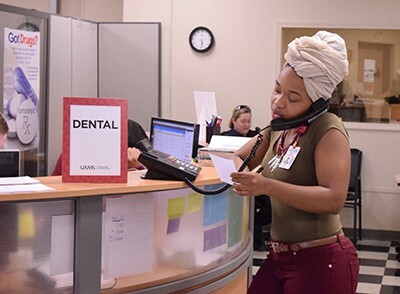 LaTasha Poore, a Master of Public Health student who volunteers as a translator at the 12th Street clinic, speaks to a patient on the telephone. LaTasha Poore, a Master of Public Health student in the College of Public Health, is one such volunteer. The 12th Street clinic also has a dental clinic where basic cleaning services and extractions are performed. The 12th Street dental clinic is staffed by dental hygiene students and UAMS’ dental residents as part of their clinical rotations. 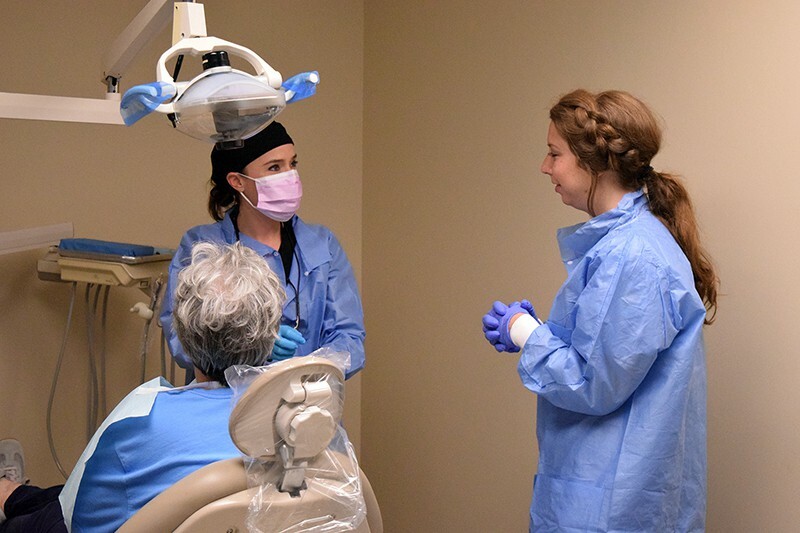 Bridget Fitzhugh, a second-year dental hygiene student, said she has enjoyed teaching her peers about the importance of oral health as well as learning from their expertise. In addition to working on the interprofessional teams or in the dental clinic, students schedule patients and answer phones. 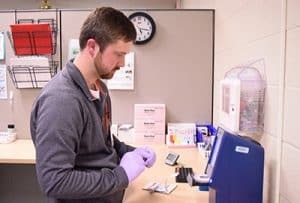 Adam Price, a third-year medical student, runs blood tests in the 12th Street clinic’s laboratory. Adam Price, a third-year medical student, spends much of his time in the clinic’s laboratory. “I really enjoy doing the labs. It is definitely an aspect of medicine that I wouldn’t have been exposed to otherwise,” he said. For Kaitlin Long, a fourth-year pharmacy student, interactions with patients and giving back to the community are the best part of volunteering at the clinic.